True Life: Kitchen Essentials. Part Two. Namaste, OMies! Maggie, here. We are back with Part Two of my ride or die kitchen essentials. Part One covered the pantry, and this week we are taking a very exciting deep dive into my refrigerator. Never thought I would be typing that sentence, but I'm excited nonetheless! Every day I'm guiding clients to work from their own OM, and in order to effectively do that, it's important that I myself am operating from a place of truth. This, to me, means ensuring my body and mind are nourished with the proper nutrients, which can get a little tough with such a hectic schedule. After years of trial and error, I have finally found what I deem to be a sustainable balance. 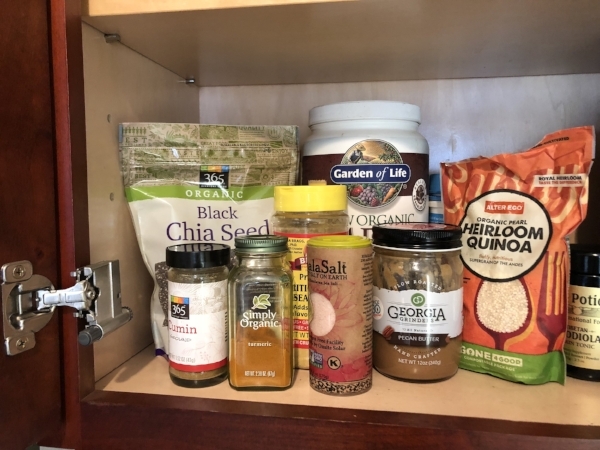 As with my pantry items from last week's post, these refrigerator staples allow me to make quick and easy meals, some of which I can eat on the go and others I can come home after a long day and have ready in 10 minutes. I could literally eat an entire pineapple if given the opportunity. I. Love. Fruit. Even in the dead of winter! I always have bananas and blueberries somewhere in my kitchen, and when I’m feeling it I’ll throw in some pineapple chunks, mango, strawberries, raspberries and/or blackberries. I try to reserve my fruit consumption to earlier in the day (not always successfully, but alas) so I have ample time to use the energy and digest the natural sugars. Throw some fruit in the freezer, and when you want a sweet little treat, eat by itself or blend with choice of milk and nut butter. Sweet tooth = satisfied. Chia, flax and hemp seeds are a part of my daily routine. I call them “super” because, yes, they are considered “superfoods,” but I also put them on a very high pedestal and credit them with making me feel SUPER. I mix all three in a mason jar and store it in the fridge for freshness, and put them in smoothies, on oatmeal, salads.. really anything that makes remotely any sense. These are another source high in Omega-3 and 6 fatty acids, which can also improve heart health and cholesterol levels. They provide a good serving of fiber, antioxidants, and are a complete protein. This doesn’t need much of an explanation. We know that greens and vegetables fuel a healthy life, and I am all aboard that train. I restock my greens and vegetables supply every week, and typically go for spinach, arugula, romaine, broccoli, cauliflower, zucchini, tomatoes, onions, peppers, sweet potatoes and butternut squash. This can change with the season, but they all give me a lot of room to mix and match for my meals. I am all about that meal prep life. I don't have a designated day to meal prep (though Sundays are a solid choice), I just do it whenever I have a few hours at home. This includes roasting vegetables, washing greens, cooking grains and proteins, and... mixing up my favorite dressings and sauces, because what is life without condiments? It's a sad life, that's what. But instead of using ketchup with mystery ingredients, prepackaged dressings with all of the oil and sodium, etc., I've started making my own! I know what you're thinking, "Maggie, that is too complicated, I'm not down with this." But let me tell you, if I can get down with it, then you can too. My favorite salad dressing is simply a mixture of olive oil, apple cider vinegar, lemon juice, salt and pepper. Sometimes I will put a serving of tahini in there, and it has a faint resemblance to caesar dressing. My favorite sauce is a vegan cheese sauce I found on the Instagram; a blend of cashews, olive oil, water, nutritional yeast, paprika, salt and pepper. Sometimes I will throw in some spinach to get those extra greens, too! It's creamy, it's delicious, it's everything. I will prep a batch of both of these and store them in the fridge for the week. If you have questions on exact recipes, PLEASE ask, because I can talk about this stuff for hours. I tend to avoid dairy. I’ve discovered I just feel lighter without it! So, in comes non-dairy milk, typically almond, for smoothies, oatmeal, coffee, and any recipe that calls for milk. I was never much a milk drinker, I actually don’t think I’ve ever had a full glass, so I suppose I don’t know what I’m missing by choosing this substitute, but it keeps my tummy happy! And that’s that! I hope you enjoyed this little peek into my everyday life and it gave you some inspiration to find what makes YOU feel good! I’d love to hear your feedback or any questions in the comment section below, or reach out on Instagram. True Life: Kitchen Essentials. Part One. As a full-time yoga and meditation teacher, I am always on the go, running to and from different parts of the city to get to class and meet students. It’s so important to me that while I do this, I can still maintain a healthy lifestyle. In fact, a healthy lifestyle FUELS me while running around every day! So, how do I do this? Well, I’m glad you asked. What we put into our bodies is the foundation that keeps us going every day. Food and nutrients energize us in the morning and energize us throughout the day. After years of trial and error, I have found a group of staple items to make quick and easy meals, some of which I can eat on the go and others I can come home after a long day and have ready in 10 minutes. For someone whose health is very important to her, these are my ride or dies. This post will be broken up into two parts, pantry and fridge, because let’s face it -- there’s too much goodness for just one post. In my pantry at any given time, you can find more than one jar of almond butter. If I’m feeling frisky, maybe I’ll throw in some cashew butter and/or pecan butter (I’m looking at you, Georgia Grinders). I also always have avocados, oils, butter/ghee and raw cashews. These GOOD fats (*cue avocado meme, see below*) nourish and satiate your bod to keep you going through the day. They give not just your body energy but your brain (enter: omega-3 fatty acids). Minimal Wellness nutritionist Rebecca Shern, RD said these sources of nutrition also help maintain blood sugar levels and cut cravings. During the week, I am typically running around and need quick and easy meals to keep me full. Protein powder, specifically designated as a meal replacement, gives me energy and satiety that lasts. I have tried many, many brands but have found love in a hopeless place - with the Garden of Life brand, a raw and plant-based protein with a billion superfoods (the website says 44 - but that’s almost a billion). I use protein powder every day mainly in smoothies or smoothie bowls. Do I need to clarify this isn’t an ad? I just love the stuff, and really feel it gives nutrients my body needs. Quinoa, lentils and rice, oh my! I don’t eat many animal products. I try to listen to my body and what it wants, and the past year or so it hasn’t had much of a need for meat. But, I digress, because of this, a lot of my meals come with a heavy helping of grains and/or legumes. Quinoa is a complete protein, with all nine essential amino acids, and has twice the fiber of most other grains. It’s also a great source of iron, which is great for anemic people such as myself. Lentils are great for heart health, digestion and protein. Rice is pretty much just used when I don’t have quinoa or lentils. I take my spice game very seriously. Every single meal is spiced/seasoned heavily. I couldn’t even tell you measurements of what I use, because I tend to just dump everything onto food and see how it tastes. This *usually* ends well. In my usual rotation is turmeric, cumin, garlic powder, cayenne, nutritional yeast, black pepper and Himalayan pink salt. Sometimes I use these all together, sometimes I pick and choose. These all have a variety of health benefits; they provide a good dose of antioxidants, help with inflammation and more. Nutritional yeast is an amazing source of B-12, which we tend to be deficient in, protein and folic acid. Do your research - for all of the juicy benefits, and the delicious taste combos :). I have a serious problem, and that problem is an insatiable need for chocolate! I am addicted to Eating Evolved caramel and sea salt coconut butter cups. They satisfy any and every sweet craving I have, and they’re made with real ingredients: coconut, cacao, coconut sugar, cacao butter and himalayan sea salt. Growing up, my house was always stocked with snacks on snacks. You know that house in the neighborhood all the kids flocked to because of the snack selection? That was us. We had literal cakes for no apparent reason, no celebration (hi mom, I love you, thanks for making every day a celebration). Long story short, I have gone through life unable to shake this sweet tooth I developed. Instead of going crazy depriving myself, I found substitutes, which are arguably better than the real thing, with REAL ingredients. 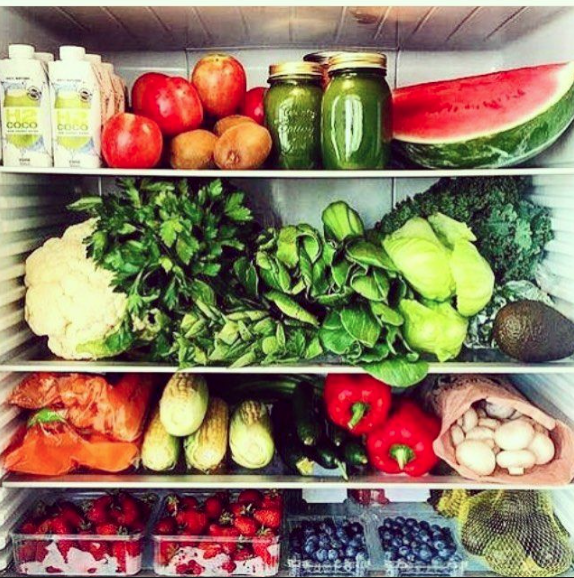 That’s the key, no matter what you’re eating - real, whole ingredients that are nice and easy on your beautiful body. And for now, this is where I leave you. Leave your thoughts and/or questions in the comments below, or feel free to connect with me on Instagram or Facebook. Check back next week for Part TWO where we will take a thrilling and riveting look inside my refrigerator! It’s official: yoga has reached the tipping point. Long viewed as a light form of exercise for new age hippies, the mainstream has come to embrace the teachings of the 5,000 year-old practice as a powerful tool for self-improvement, overall health and general well-being. Unlike many health and fitness fads that have come and gone over the years, however, it’s not just fitness enthusiasts, celebrities and media personalities that are getting on board the zen train. The corporate world has taken notice of the positive effects that yoga, meditation and a mindful approach to business have proven to have on employees and, in turn, the bottom line. Study after study has found that these practices reduce stress, improve focus, build camaraderie and contribute to a higher functioning workplace, and our New York City startup is aiming to lead the revolution. Allow us to introduce ourselves: we go by Work From Om, but our goals and intentions are set by myself, Ashley Mancuso, and co-founder Sarah Vaynerman. We’re two certified and passionate yoga teachers here to serve the souls of professionals working in one of America’s most stressed-out cities by providing yoga, meditation and mindfulness training for the workplace.